This next picture shows me again. This time I’m carrying two just-scalded birds to the plucker. That tub-plucker is the original Whizbang. It is 5 years old. I’ve used it many times and I’ve loaned it to friends many times and it works as good as the day I made it. 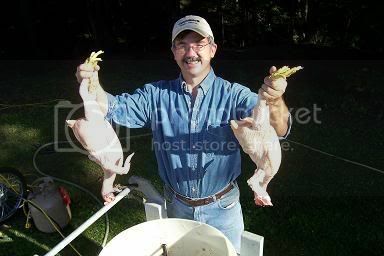 And this next picture shows two birds in the tub, right after plucking. Notice the many black rubber fingers. They do the work of picking the feathers off the birds so you don’t have to. There is a round plate (the “featherplate”) at the bottom of the tub that spins around and tumbles the birds. Eight years ago my wife and I decided to try raising our own chickens on pasture. We were motivated to do this by a strong desire to have meat that was as healthful and flavorful as it could possibly be. So I ordered 25 day-old Cornish meat birds from a hatchery. We raised those cute little chicks into not-so-cute, but wonderfully plump, broilers. We found that being small-scale chicken “farmers” was easy to do and a lot of fun. Then it came time to “process” the fatted fowls. “Fun” is not a word I would use to describe that first experience of butchering poultry. The worst part of it was, by far, hand-plucking all those steaming-wet, stinking feathers (after scalding the birds). Hand-plucking was messy. Hand-plucking was tedious. Hand-plucking was time consuming. Hand-plucking was, in short, nasty, discouraging work. There had to be a better way. No sane person enjoys hand-plucking chickens. That being the case, machines have been developed to do the onerous task. There are currently two different types of plucking machines on the market. One type of machine is the tabletop plucker. It consists of a rotating drum studded with rubber picker fingers. A flat table is positioned in front of the drum. To use a tabletop plucker, you hold your scalded bird up to the spinning fingers and manually move it around while the fingers flail the feathers off. Once you become skilled at using a tabletop plucker, you can pluck one chicken about every 30 seconds. This is certainly an improvement over hand-plucking but there are several drawbacks to these machines. 1) You can only pluck one bird at a time 2) you still have to get your hands into the work 3) it takes practice to do a good and fast job 4) if you don’t hold onto your bird tight, the fingers will yank that critter right out of your hands. Tabletop pluckers are okay but they can’t begin to compare to tub-style pluckers. A tub plucker consists of a tub that you simply drop one or more scalded birds into. At the bottom of the tub is a round “featherplate,” studded with rubber plucker fingers. The plate spins, the birds tumble around. In about 15 seconds the chickens are bare naked and squeaky clean. That’s right, I said 15 seconds! Nothing could be easier (and more fun) than dropping your scalded critters into a tub and watching the machine do all the dirty work. If you’ve never seen a tub plucker in action, this may all sound too good to be true. If that’s the case, let me take a moment to assure you that it is an absolute fact. The secret to getting the best pick is to properly scald the birds. Once that is done (and it isn’t hard to do) the machine will remove virtually every feather, including pin feathers. There will usually be a couple odd stubs remaining, and maybe a large feather or two will be left on their tail or wing tips. Such feathers can be pulled right out in no time at all. The skin does not break when plucking (unless your scald is too hot) and bruising never occurs. When I first saw a tub plucker in action, I couldn’t believe my eyes. I knew I had to have one. Ready-made tub pluckers are expensive. The cheapest machine I could find at the time was around $2,000. That was a bit high for this thrifty, part-time chicken farmer to justify. Necessity is the mother of invention. And so is poverty. Having seen a tub-plucker up close and personal, I realized they are really very basic machines. In fact, they are so basic that I figured I could just make one myself and thereby save myself a bundle of money. The plucker wasn’t quite as easy to develop as I thought it would be. I had to work several months building and refining my prototype plucker until it functioned like those expensive, already-made units. But when I was finished, the device worked so doggone good that I gave it a special name: The Whizbang Plucker. Whizbang is a dictionary word that means, conspicuous for speed, excellence, or startling effect. It is a perfectly appropriate name. Better yet, I spent less than $500 on parts to build my Whizbang. That was using all new parts. If I had, for example, a used motor that would have worked, the final cost would have been less than $400. Some people mistakenly believe I invented the tub-style chicken plucker. What I actually did was figure out a simple design for making a sturdy and effective plucker using basic materials like 2x4 lumber and a recycled plastic 55 gallon drum. While a few other innovative backyard builders around the country had cobbled together their own homemade units, I was the first to come up with an attractive, standardized, easy-to-build plan. I figured there must be a lot of other people like me out there— people who needed a simple, inexpensive, yet well-built and effective, plucker. So it was with that in mind that I wrote the Whizbang Plucker Planbook. 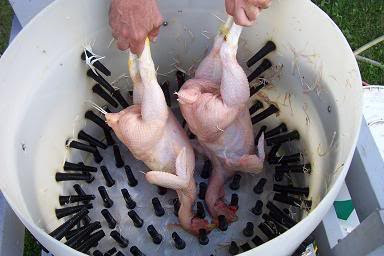 It is officially titled, Anyone Can Build A Tub-Style Mechanical Chicken Plucker. The book is now in its fifth printing. It has 60 pages and 60 drawings. It tells you EVERYTHING you need to know to build your own Whizbang plucker. Everything. Yes, You Can Build A Whizbang!! You don’t need to be an engineer to understand my plans and put together your own Whizbang plucking machine. And you don’t have to be a welder or machinist either. If you have basic carpentry tools and skills, you can do it. The book also provides you with information about where to get all the needed components for your plucker. Once you’ve rounded up all the parts, you should be able to have your Whizbang assembled and working in a weekend. You’ll find the Whizbang is a dependable unit. And since it is so simple in design, very little can go wrong with it. But if, perchance, something does go wrong, you’ll be able to fix it because, after all, you will have built it! If properly cared for, your Whizbang will dependably pluck thousands of birds for years to come. And it will pluck chickens for all your chicken farming friends and relatives too! Some people even rent their Whizbang pluckers out. The Whizbang Plucker will pluck turkeys, ducks and geese too. It will pluck turkeys almost as well as chickens. It does ducks fairly well. Geese are more of a challenge. But ducks and geese do not pick as well as chickens and turkeys in any mechanical plucker. This isn’t to say they don’t pluck well, they just don’t pluck AS well. 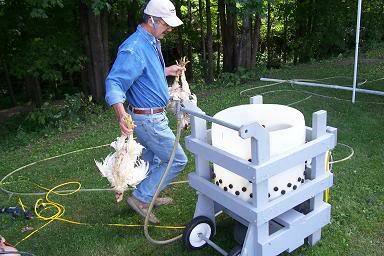 Homemade Whizbang Pluckers are now being used by backyard and small-farm poultry producers all across the United States. They are also in Europe, Asia, Africa, Australia, South America, and Canada. The planbook has been featured in BackHome magazine, Countryside magazine, Small Farm Today magazine, Mother Earth News, Farm Show, APPA GRIT!, NOFA NY, MOFGA, and several other publications. The Yahoo discussion group, WhizbangChickenPluckers, has over 1,400 members. The group is free to join and, once there, you can see photos of several homemade whizbang-inspired pluckers from across the United States. You can also read A LOT of positive Whizbang feedback from readers and pluckerbuilders. The ongoing discussion (and archived past discussion) is a rich resource of information on poultry processing in general and pluckermaking in particular. Here’s a link to the group. “Just a short note. I finally finished up our chicken plucker and on the 4th of July some friends came over to help us inaugurate it. We killed and scalded the first two birds, set them in the plucker, and I held my breath as I hit the switch. Total success! Feathers flying off, skin emerging. Fifteen to twenty seconds and we had naked birds ready to be eviscerated. “I just had to write to tell you that my plucker works great! The plucker was a project for my 12-year-old son to complete.... Thank you SO MUCH for writing this book! It was so much fun to read, but not half as much fun as it was watching the chickens getting plucked. Your book made a chore into a fun experience. The above unsolicited quotations are a very small sampling of the MANY positive responses I’ve received from people who have used the Whizbang planbook to build their own plucker. Wish we had one of those pluckers now, since we have resorted to once again pulling off the skin with the feathers. Maybe next year. Thankfully, my job is only to cut up the chickens after they make it into the house! Would you be willing to give an estimate of the parts cost to build your Whizbang Plucker or Scalder? It sounds like a great product and a great project. But it'd be nice to have a general idea of how much I'll need to spend to build these machines. As noted in the above article, I spent a bit less than $500 to build my own plucker using all new parts. I suspect the current price is still somewhere around that amount. Those who are good at salvaging used parts (a motor in particular) or finding good deals, have built their Whizbang Plucker for a whole lot less than that. I've heard of prices as low as $200, but many people are getting the job done for $300 to $400. Pricing for the scalder can vary considerably based on how "deluxe" you make it and, again, if you buy new parts or utilize some salvaged parts. For example, a new propane water heater can be expensive, but you need not use a new one. I discuss how much it costs to build a scalder in more detail in the photo essay which you can find the link to in the article above. we only butcher 100 chickens per year. if i could build one for $200 it might justify not hand plucking. the only problem is the fingers cost $99. how long do the fingers last? The way prices of everything are going up, you'll have to be a real good scrounger to build a Whizbang Plucker for $200. The price of fingers have gone up three times since my son Robert set his price at $99, and we have been informed of another price increase. Dod you know there is a worldwide rubber shortage? The fingers should last a long time. The ones on my original Whizbang (now about ten years old) are all still just fine. Personally, I would want a plucker if I did "only" 100 chickens a year. That's a lot of hand-plucking. Once you've used a mechanical plucker like the Whizbang, you'll realize what an incredibly useful tool it is. Thanks for the question. I got 3 to many rooster chicks with my pullet order this year..so when they matured I had to butcher them for the freezer..I have ordered the whizbang plucker book for my husband and he promises to build me on for next fall..but this time I did it by hand..Next year I will need the plucker..as I intend to raise closer to 20 birds for the freezer! I am always looking for new ideas..and as you will see by my blog I have learned alot from Herrick! You scald the chickens? I mean you don't cut their throats? (they don't look cut). That's inhumane and sick! How would you like to be scalded? of course the birds are dispatched first silly. Scalding them alive? Please, use common sense. Just because you can't see their throats slit doesn't mean they aren't. Would hand plucking work best with rubber coated gloves? Rubber gloves will keep your hands from getting wet but they will not make hand-plucking any easier (hard to get a grip). However, I've heard that the knit work gloves with the rubber dots on them are useful for hand plucking. I haven't tried it but would imagine that the knit gloves with rubber dots would make it easier. This does appear to be a great help though. Great post. Question for you - purchased your whiz bang plucker kit. I also am ordering your shrink bags; you recommend waiting till the rigor mortis stage has passed before shrink wrapping. Are we talking hours or days here? Please check out Tough Chickens & Tender Solutions at my Whizbang Plucker web site for an informative discussion about ageing poultry. its a matter of fact that the bloody scalder can suggest to plunge alive the poor birds , isnt a silly comment the previous one. Not specify is a serious lack of care for animal sufferance, beside the fact Im totally against the whole procedure and business based on animal exploitation ., while the world is leading to a plant based diet for all the obvious reasons of compassion,. ethic, health, environment, you name ...Who stil love killing for the sake of it , is far behind evolution! hey idiot...their not killing for the sake of killing...like humans do. It's for food. Get a life and gete caught up with reality...animals are for food and create food. What if you have no carpentry tools or skills? Where does a beginner begin? The Deliberate Agrarian (Herrick Kimball) has now launched a video blog. Click the picture for details. "If you are on the wrong road, progress means doing an about-turn and walking back to the right road." I (Herrick KImball) have been blogging here about Faith, Family & Livin' The Good Life since 2005. Browse down this column and you will discover a rich resource of contra-industrial thought, down-to-earth inspiration & useful how-to information. CLICK HERE to view the archive of links to past Deliberate Agrarian monthly "blogazines." This Man, Now Deceased, Predicted The Economic Decline of America Back in The 1950's. Have You Seen My Whizbang Gardening Book? 5 stars at Amazon. Click the cover to learn more. Click on Sergeant York to read the story. Esther Stermer Was A Conspiracy Theorist! click the clothespin and learn all about them. Have You been to The Agrarian Foundation Article Archives? What Would an Agrarian Monetary System Look Like? Well, for one thing, it would NOT be based on paper money. Click Andy Jackson for some details. Have You Been To Planet Whizbang? It's my deliberate agrarian home business. Click the beet and check it out. These delightful little notebooks are a great down-to-earth tool. Click the beet to learn more. Have You Seen The Planet Whizbang Wheel Hoe I Invented? Click on that beautiful handful of sifted compost. We make our own maple syrup. Click on the picture for complete how-to details. Have You Seen Leo Sprauer's Handcrafted Hop Hoe? Click the picture to learn more. E.P. Roe, that is. Click on his picture to read some excerpts from this remarkable Christian-agrarian author of the 1800s. Have You Been To My New Instructional Web Site? "It is not necessary to make men, foolish or serious, agree with me, no matter what the principle is. They may have different faculties." There are only two kinds of men in this world. Click the picture to learn more. Building Rome, as fast as I can! Spring Has Finally Sprung - David brought me crab apple tree blossoms and lilacs. Now that spring is finally here, summer can't be too far away! Anyone can make a Whizbang Garden Cart. Click on the picture to learn how. Have You Seen Jax Hamlin's Chickens? The Pligrims did NOT come to America for religious freedom. Swinging homemade maces at each other can be great fun! If he can do it, so can you. This is the kind of food we dream about in the depths of winter. "Every Bean's A Blessing, Boys"